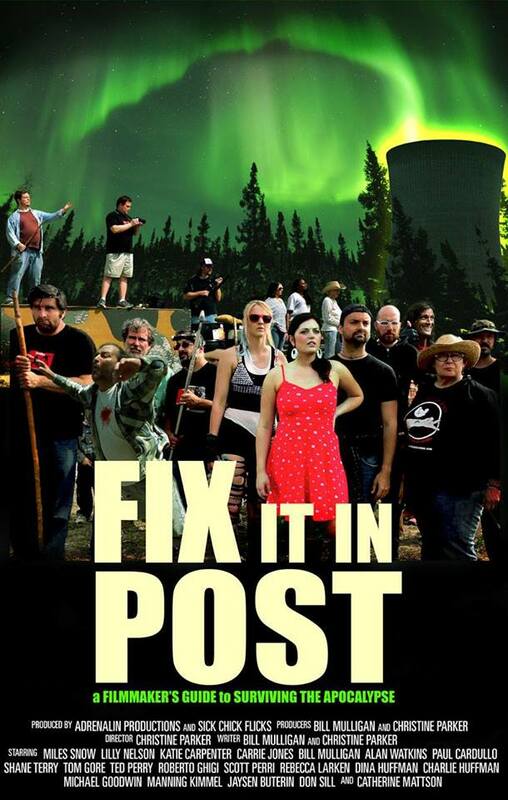 Christine Parker and Bill Mulligan of Adrenalin Productions and Sick Chick Flicks return with their newest film: FIX IT IN POST, a post-apocalyptic meta-comedy which is already making quite the splash on the film festival circuit. Nerd Nation Magazine was in attendance at the Charlotte, NC showing at ConCarolinas 2015. The film opens with a bang and makes excellent use of both digital effects and stock footage, which may not mean much to many of you dear readers out there, but it really worked for this humble writer and really served to hook the audience in. Still here? Okay! Now let’s get to it! The story revolves around William, a struggling independent filmmaker who is working (quite poorly it seems) on a film called “Zombies vs Ninjas”. The production – which is being shot in the wilderness – is an absolute disaster, the crew is very rag-tag and dysfunctional, and everything seems to be falling apart, when suddenly… the actual apocalypse occurs. Trying to figure out some way to survive and build a community out in the woods with no power, no supplies, no infrastructure, and let’s be honest here… practically no clue. Along the way, the band of movie-making misfits run across a group of gun-toting, cannibalistic, hillbilly survivalists who are amazingly well-supplied. After being caught trying to steal food, the group of survivors are held captive but are given a chance to survive by making and putting on live plays to entertain them. But when a rival filmmaking troupe shows up, their insane captors have them face off in a “movie making” contest where the winner gets to attend the harvest feast… and the loser becomes part of the harvest feast. How will this contest go down? Will anyone walk away alive? What happens next? Well, you’ll just have to watch the movie and find out! It’s a pretty well-executed comedy and definitely has some good laughs, and very funny moments throughout. It’s packed full of insider references that may only work for people who have ever worked on a film, but movie jargon aside, it could still hold up as a very good comedy for anyone else, too. That said, it’s not without its flaws. The movie does tend to drag quite a bit at times, and could possibly do with a re-editing/a few more cuts, there are a few minor sound issues, and while the majority of the cast does a fine job, there are a few performances that fall a little flat and kind of come off as a bit too forced. That said, this film is so incredibly meta that all of this may have indeed been intentional.